Should Donald Trump and Republicans be losing sleep over 2020? The gravy had barely reached room temperature after Americans’ Thanksgiving Day celebrations and already the pundit class was busy prophesying woe for the president’s reelection prospects heading into the next campaign cycle. The cloudy forecast was hardly unexpected; media talkers would take just about any indication of Trumpian slippage as a sign of hope for Democrats and their leftist minions to move back into the White House come January of 2021. The (current) minority party is yet to seize the reins of House power – and of course the Democrat presidential field isn’t fully filled out – but if you trust the media to set the stage Trump might just as well end his reelection effort now and spare the country the trouble of a contentious national vote. Are there truly warning signs on the horizon or merely a few quirks that need tweaking? Steven Shepard wrote at Politico, “While it’s true that most presidents who see their party suffer major losses in their first midterm election get reelected anyway, Trump isn’t most presidents — and there are lots of blaring-red warning lights in this month’s election results for his bid for a second term. “Unlike most of his predecessors, he’s been persistently unpopular, with approval ratings mired in the 40-percent range — so far, he’s the only president in the modern era whose job approval ratings have never been over 50 percent, according to Gallup. You know what? Everything Shepard wrote is true, yet do they truly constitute “warning signs” or simply constitute areas Trump and his team need to work on? Everyone realizes it’s easier for an opposition party to win seats in a president’s first midterm election than it is to hold them permanently -- and things will change markedly between now and Election Day 2020. Even Politico’s “experts” intimated midterms are definitely not predictive of a president’s reelection prospects and there will be plenty of juicy specifics for Trump to stake a presidential candidacy on in two years. Democrats will receive a far greater share of Americans’ scrutiny from here on out (they’re already getting it) and just like what happens when blood touches oxygen, it turns from blue to red. Add in a certain-to-be-prickly Democrat primary and the free-for-all should be legendary. In years past there’d always been a liberal establishment favorite and perhaps a slightly off-the-wall main challenger, but this time around there’s no clear ruling class frontrunner to lead the pack. As far as the eye can see Democrat voters crave someone whose prime attribute is extremism and Trump resistance. What will the perhaps two dozen Democrat presidential wannabes offer as justifications for rejecting Trump? What Obama-like “messiah” is there to wow throngs of party faithful with guarantees of halting the rise of the oceans and grand visions of “hope and change?” Would the Democrat establishment welcome another Bernie Sanders run and (thanks to intraparty rules changes) probable win? Will all Democrats embrace the radical “transformation” in liberal circles where “Medicare for All” and free college tuition are standard planks in the platform? Americans demand details in presidential campaigns. 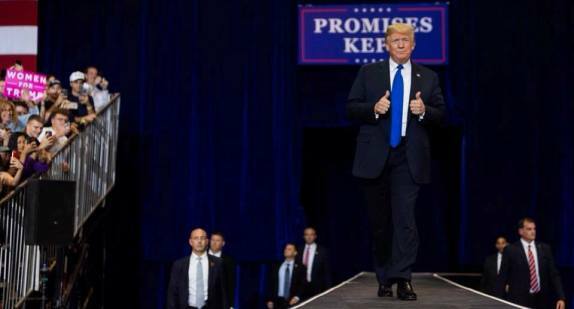 Trump’s enemies may not like anything about him but they’d still admit his first candidacy was chock full of plans – and he’s kept a big chunk of his promises. “Make America Great Again” was a catchy slogan, too, complete with ready-made imagery for voters to latch onto. Elections may always be about the future but the (recent) past is a big part of the equation in quadrennial campaigns. Like Reagan did in 1984, Trump will most likely enjoy a healthy economy to tout during debates and campaign rallies. He’ll also have foreign policy achievements to boast about, two Supreme Court appointments to push (along with a multitude of lower court confirmations), a stronger military to plug and a recovering manufacturing base to highlight. What will the Democrat “winner” come up with to contrast? The usual -- dreams of big government programs, additional politically correct nonsense and Obama-like malaise in the economy. Almost certainly judicial nominations will play a major role in people’s minds as well and few non-Democrats want a return to activist judges who ignore the Constitution and dictate from the bench. Trump will also relish the enormous advantage of incumbency. Occasions like his recent trip to California to oversee fire damage (with Democrats Gavin Newsom and Jerry Brown in tow) provide terrific settings to demonstrate presidential leadership. Democrats don’t have a single candidate who screams “leader,” either. Remember when Hurricane Sandy arrived a week before the 2012 election and Obama’s walk with New Jersey Governor Chris Christie (the hug?) made the president look concerned and apolitical, ready to help suffering people? Who would stand opposite a four-year battle-tested President Trump and appear ready to assume the job? Kamala Harris? Hillary Clinton? Beto O’Rourke? Bernie Sanders? Heck, Sanders is notorious for declaring “climate change” is the most pressing national security threat today. Will Americans agree? Is “climate change” taking over Europe and perpetrating massacres at airports and public spaces? What pundits and doomsayers don’t get is presidential elections are always more substantive than midterm elections. As the only purely nationwide election, national issues take precedence. This year some Republican House candidates refused to base their candidacies on subjects of national scope – immigration, national security and economic expansion – and they paid for it. Trump will not only touch on these topics he’ll bludgeon his Democrat opponent with them. What will the Democrat nominee counter with? Abolishing ICE? Amnesty for every illegal alien? Unisex bathrooms? More government regulation of the economy? Higher taxes? A revival of the Iran deal? Rejoining the Paris climate accord? Open borders? Surrendering what’s left of American sovereignty to the U.N.? Aside from the fact it’s awful early to predict the 2020 election, the media is going too far in claiming there are “warning signs” for Trump. The president will again receive the vast majority of media focus this year making it extremely difficult for any single Democrat to break out of the pack. Should Joe Biden announce a run he’ll certainly open as the party favorite -- but by no means is he a lock. It's been suggested in this space (and many others) Hillary Clinton won’t resist the temptation of another run… maybe she’ll even wait long enough for the Democrat field to destroy itself and then swoop in as a party “savior” to combat Trump in a rematch of 2016. It'll be fascinating to witness. “Warning signs?” Hmph. Think of them as personal challenges. Speaking of, Supreme Court elder stateswoman Justice Ruth Bader Ginsburg is having some issues of her own. As the left’s loudest voice and greatest hope for a return to a leftist, activist jurisprudence, Ginsburg must deal with her health complicities and (for lack of a better way to put it) stay alive. Lydia Wheeler reported at The Hill, “At 85, Ginsburg is the oldest member of the Supreme Court, and this month’s health scare left many wondering if she’ll really serve for five more years as promised. But she’s not the only one in recovery mode. “Washington is slowly recuperating from the bitter battle over Justice Brett Kavanaugh’s confirmation. Another vacancy on the bench would surely lead to an explosive fight with liberals trying in vain to prevent President Trump from turning the court into a conservative stronghold with a third nominee. Wheeler’s article contains quotes from Ginsburg backers who speak glowingly of the Clinton appointee’s workout regimen, toughness and resiliency, but age stops for no one and she’ll be 86 years-old next March. True, average life expectancies for American females are quite high, but most women at that stage of life aren’t working twelve hour days and dealing with the enormous strain of a Supreme Court docket full of cases. It's more than a little ironic liberals often cite the possibility of a 25th Amendment challenge to President Trump due to his supposed erratic behavior and mental instability (they made similar senility claims about Ronald Reagan in the 80’s) but Democrats won’t address the competence problem surrounding a mid-octogenarian leftist lawyer who’s a two-time cancer survivor with a well-documented tendency to break bones. To their credit, some liberals questioned why Ginsburg and 80-year-old fellow Democrat Stephen Breyer didn’t voluntarily step down several years ago with the presidency and Senate safe in Democrats’ hands. Even if Democrats manage to bump off Trump in 2020 they could still face the reality of a GOP controlled senate for years to come, making it tougher (if not impossible) to replace any retired liberal justice with another constitution-bending activist. One possibility would be for Ginsburg to retire at the beginning of 2020, instantly creating a fascinating scenario where Republican Majority Leader Mitch McConnell would be hard pressed to keep his vow to not hold Supreme Court confirmation hearings during a presidential election year. Trump proponents would point out the pledge only applies to presidents and senate majorities of different parties, but if the Republicans went ahead and confirmed a Ginsburg replacement on a party-line vote… it would become the issue in 2020. Besides, GOPers might be better off holding the seat open and running on it as they did in 2016. Republican senate candidates face a much tougher map in 2020, and, with Trump on the ballot alongside them, will likely do a couple points better in each race with the grassroots motivated to cement the Court in conservative originalists’ hands for decades to come. It would certainly help Republicans’ cause to use the issue to their benefit. There will be other chances to highlight differences between the parties, too. Take the Democrats’ proposal to increase federal employee retirement benefits in the next Congress. Pete Kasperowicz reported at The Washington Examiner, “House Democrats introduced legislation this week to increase annual cost-of-living adjustments for most federal employees, a possible sign they'll push for this kind of change once they control the House next year. “Rep. Gerry Connolly, D-Va., introduced the Equal COLA act along with three other Democrats. It goes without saying Connolly’s northern Virginia district contains a heavy concentration of federal workers. The congressman’s bill co-sponsors are also Democrats from the national capital region, which means the party hasn’t even taken power yet and already they’re getting their backers excited about the goody-storm to come. Imagine if Democrats were successful in passing such a proposal when there are annual trillion-dollar federal deficits and massive overspending (the fault of both parties), redundant programs, rampant fraud and bureaucratic incompetence. Give retired career federal employees more money? How would this play in those swing districts where Democrat House candidates narrowly defeated Republican incumbents earlier this month? Trump would have a field day mentioning it at each campaign stop and could easily use federal pay as a means to attack Democrats as reckless spenders and irresponsible public stewards. With Republicans in the House majority the past eight years, Democrats have bided their time waiting for an opening to reward their favored voting blocs. Now that they’re on friendlier legislative ground the temptation is overwhelming to use the power of the federal purse to buy votes. It may make the millions of federal employees across the country happy, but what about the people who didn’t enjoy a lifetime of security toiling for Uncle Sam? Objectively speaking, Democrats are finding new and better ways to set markers between the parties. Trump ran as an outsider in 2016 and can do so again in 2020. Thanks to Democrats, he’ll be able to make a convincing case for it. Can Democrats boost federal pay and claim they’re planning to drain the swamp?